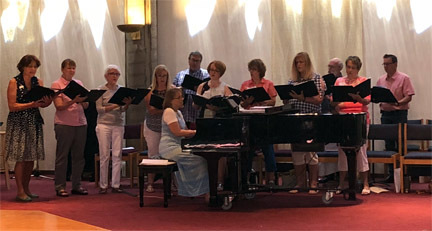 The choir at Church of the Resurrection is comprised of dedicated singers who provide music for the 10:15 am service and special occasions from September through June. 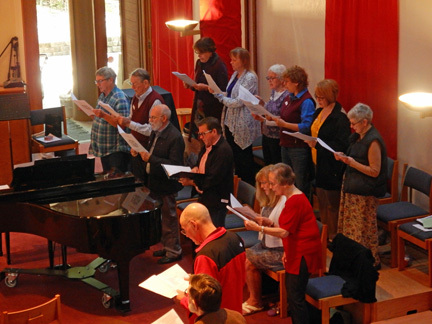 In addition to providing leadership for congregational singing of hymns and liturgical responses, the choir sings weekly anthems from a wide variety of traditional and contemporary choral literature. The music program is augmented by occasional instrumental solo and ensemble offerings. All voices are welcome to sing with the choir. The only requirement is a love of singing. Rehearsals are held on Thursday evenings at 7:00pm in the sanctuary with Sunday morning warm up at 9:30am. If you like to sing, but Thursday evenings or a regular commitment to choir doesn't work for you, please join the Impromptu Choir on the first Sunday of November, January, March and May. We meet at 9:15am only on that day to rehearse the song we will sing together in the 10:15am service."